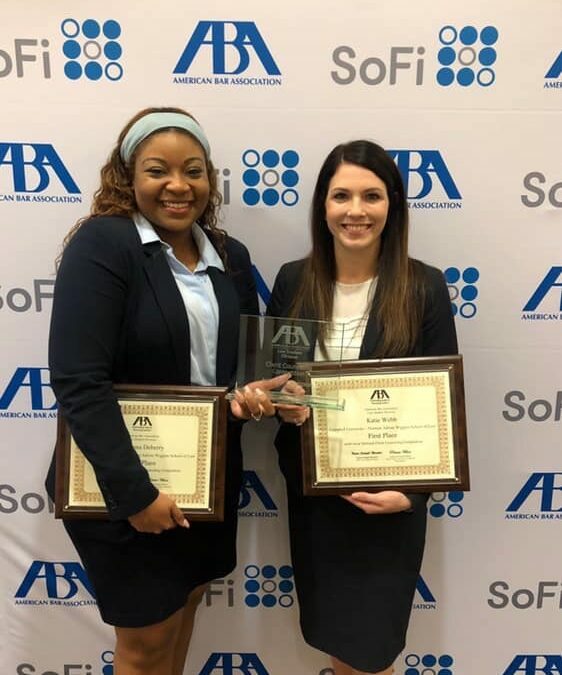 RALEIGH — Campbell Law third-year students Tatiana Terry and Katie Webb won the National ABA Client Counseling Championship on March 23, beating out 108 teams from 69 law schools to take the title at the competition. The competition took place at Baylor Law School in Waco, Texas. The Campbell Law team was also coached by Professors Jon Powell and Bobbi Jo Boyd. This year’s competition topic was Professional Responsibility. The win qualifies Campbell Law’s team to represent the United States in Dublin, Ireland, at the International Counseling Competition, which will take place April 2-6. It is the second historic national championship team Terry has competed on in as many weeks, says Professor Dan Tilley, who leads the law school’s trial advocacy program. Terry and her other third-year teammates — Nichad Davis, Maurizo Lewis-Streit, and Ashley Urquijo — were named National Champions of the National Black Law Students Association (NBLSA) Mock Trial Competition on March 16, in Little Rock, Arkansas. It was the law school’s first national championship in this competition. Campbell Law Dean J. Rich Leonard announced Riddle & Brantley, LLP is financially sponsoring the team. Campbell Law won the ABA Region 4 Client Counseling Competition in February earning their invitation to the national competition. The Client Counseling competition addresses fundamental skills necessary for all successful attorneys, namely the ability to interview, counsel, and support a client through their legal issue. Competitors conduct an initial interview with a person playing the role of the client and then address both the client’s legal and non-legal needs. Students are called on to explain various aspects of the attorney-client relationship, build rapport, determine client goals, and consider applicable law and options that may be available to the client. Riddle & Brantley, LLP is a North Carolina personal injury law firm with a focus on providing experienced legal representation for people who are injured in accidents and for families that lost a loved one due to another’s negligence. Equally important to our law firm is our goal to offer caring and reliable customer service to all our clients. This allows us to provide you with effective and knowledgeable representation as well as the comfort and security you need. Since its founding in 1976, Campbell Law has developed lawyers who possess moral conviction, social compassion, and professional competence, and who view the law as a calling to serve others. Among its accolades, the school has been recognized by the American Bar Association (ABA) as having the nation’s top Professionalism Program and by the American Academy of Trial Lawyers for having the nation’s best Trial Advocacy Program. Campbell Law boasts more than 4,200 alumni, who make their home in nearly all 50 states and beyond. Throughout 2019, Campbell Law is celebrating 40 years of graduating legal leaders and 10 years of being located in a state-of-the-art facility in the heart of North Carolina’s Capital City.